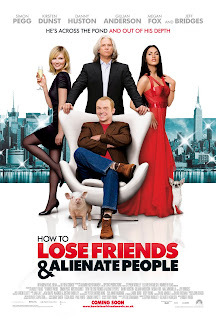 How to Lose Friends and Alienate People (2008) has a very long title. It's one of those movies which I expected to be really big but turned out to live up to small expectations. When I saw the cast, which had Simon Pegg, Kirsten Dunst (where has she been lately?? ), Megan Fox (in a non-blockbuster role), and Jeff Bridges, I knew that I may be in for a winner. And at first, it seemed that way. But as the movie droned on, it lost the winning magic right up until it seemed non-existent. Okay, it was amusing seeing Megan Fox trying to act like Mother Teresa, because she really can't act that well. The movie is about Hollywood, or New York rather. It takes a look at the world of fame and tabloid magazines and starlets of mediocre films. We follow Brit Sidney Young (Pegg), a writer who enjoys exploiting the image of stars. He moves to New York, and starts to work for a prestigious magazine which follows the lives of stars. There he meets Alison (Dunst), who teaches him the American way of life and who is the love interest of the story. Sidney is given an interview opportunity with young starlet Sophie Maes (Fox), who he also falls in love with, but only because of her beauty. The entire plot revolves around a Brit trying to become an American, and also the weird love story between Sidney and Alison. I quite enjoyed the first half, but found myself kind of tired by the next half. All in all, you should see this if you want to know what fame is really like. But if you have no interest, save it for a rainy day.